John didn’t know he was going to die that night. He woke up and went about his day like every other American that morning. He didn’t know that a simple government screw up was about to cost him his life. He was 27 years old, with his whole life ahead of him. It was 4:10 pm on August 14th, 2003. That’s when the massive blackout struck. In the blink of an eye, it took power from over 45 million people in 8 states across the U.S.
And it took John’s life. See, that night John did something that most of the other 45 million Americans without power did. He lit some candles. Then he fell asleep. And he never woke up. The candles caught his home on fire and he died in his sleep. The young Michigan man died for no good reason. It could have been avoided. Just 50 miles away from John another man lost his life during the blackout. This man was prepared. He was ready for a disaster. He had a backup generator. But the generator ended up killing him. See, it used gas. And that gas poisoned him with carbon monoxide and robbed him of his life. Both of these men could have survived if they had one simple thing. A generator that didn’t rely on Fossil Fuels for energy. A generator that uses space-age technology to capture the power of the sun. After years of research and scouting for the perfect solution, I found it. The Patriot Power Generator 1500. There’s only one catch. We don’t have a lot of inventory. And we could run out of generators at any time. This isn’t some false “we only have 20 in the warehouse” type of thing. This is very real. We sold out of our first run of 500 generators in 8 days. We sold out of our second run of 1,000 generators in 14 days. We recently offered 500 units exclusively to our customers in April and sold out in 10 days. Unfortunately, due to the current manufacturing process it takes 3-4 months from the day we order until we receive more units. The good news is that if you’re reading this letter right now, that means we have at least one generator in stock. But once we run out, which we always do, it could be months before we receive more. So my suggestion is to act today. If you wait, it may be too late. Do you know that your life, and the life of everyone you love, is hanging in the balance RIGHT NOW? You and your family are literally one step away from a 21st-century apocalypse. And it’s shocking it hasn’t been destroyed... YET. I'm not talking about terror attacks that are in the planning stages. And yet, for decades the government has managed to bury this terrifying threat, and what’s worse, they’re still not doing anything to stop it. If you leave this page you'll miss your chance to protect yourself and your family from what's just around the corner. A lot of people are blind to what's coming. The mainstream media and the establishment government have got most folks living in a land of make-believe. Sitting slack-jawed watching reality shows, drinking their designer coffee and reading celebrity gossip rags. And when this smoking volcano finally erupts, there won't be any place to hide. This threat doesn't play favorites, folks. ANYONE can become easy prey. If you're unprepared, you'll be bulldozed along with everyone else in the path of destruction. So that said, you have two choices. You choose to be a survivor or choose to be a victim. If you came to this page expecting some bland, talking head commentary, you've come to the WRONG PLACE! If you buy the government's robotic talking points hook, line, and sinker, then you probably should leave now. Because what I'm about to reveal will make your head spin in disbelief. But if you're like other Patriots who are sick and tired of being fed a line of garbage straight from Washington elites while watching our great nation go down in flames, then by all means… keep watching. Know this though… what I'm about to share with you is explosive stuff. If you leave this page don't be surprised to find that my video’s been hijacked by the NSA cyber-cops and taken down. So if you value your freedom and your family's wellbeing, read it now, while you still can. Good. That tells me something about you. You're likely wondering what the heck happened to the America you grew up in. And how we ended up here in a wreck of a once glorious nation. As many as 47 million freeloaders on food stamps, and entitlements gone crazy – threatening to bankrupt the country. And there’s no shortage of scandals. Real ones, and “fake news” the mainstream media likes to focus on to get everyone at each other’s throats. But the foundation of our society, our nation's power grid, hardly gets any press. And nothing will matter if it goes under from a well-planned terrorist attack. When the grid falls, everything we know, love, and cherish falls with it. Because the truth is, losing the grid would be like watching our country have a heart attack. When the heart stops pumping, everything shuts down and the patient flatlines. Veteran news anchor Ted Koppel writes about this exact scenario in his best-selling book “Lights Out.” He describes in great detail how attacks on America's grid aren't just likely. They're already happening! And how the feds are shockingly unprepared. Our great country would be crippled in a matter of minutes, before our enemies even have boots on the ground. Imagine your life frozen in time right at the moment the power fails... and that you'd begin to lose everything in that split second. Lights all over the country would go out, throwing people into total darkness. Your fridge, electric range, and microwave would be dead, and all the fresh food you had to keep cold would rot. The canned and boxed food you had in the pantry would run out in a matter of days. Your thermostat wouldn't work, making your house feel like an oven or a meat locker. Plus, extremes in temperature can be life threatening to children, the elderly, or those who are weak or ill. Your well couldn't pump any fresh water into your house. And even if you don't have a well, a total grid failure means NO FRESH WATER supply to drink, cook or clean with, or let's face it, FLUSH. Your home would go from a sanctuary to a hazmat zone. Garbage would pile up everywhere, attracting insects, rats, and plagues of disease. And something that makes you realize how helpless you really are without power? All your communication devices would be as useful as tin-can telephones. No smart phones, tablets, or computers. You'd be isolated and alone, cut off from your friends and family… or any form of help. Supermarkets would be picked over – shelves empty within hours. Looters would make quick work of any remaining stock. And they'd keep it for themselves or sell it at jacked-up prices to desperate people clamoring for food. Not like you could get to the money in your bank account anyway! Credit cards? They'd be worthless. About as valuable as the plastic they're made from. Traffic lights would be toast, causing gridlock and fatal accidents. Hospitals may buy a little time with stand-by generators, but pretty soon bodies would start piling up. Schools would basically cease to exist, and children would have to stay home. Gas stations would be bone dry… even if they had gas, they couldn’t pump without power. Police would be helpless as criminals roamed the streets like rabid dogs, unable to take or respond to 911 emergencies. And soon robberies, rapes, murder, and mayhem would rise to epidemic levels. Society would become a deadly free-for-all in no time. Sounds like something out of a Stephen King novel, right? Well, it isn't folks. This isn't some tin-foil hat wearing conspiracy theory. Experts agree, the threat is quite real. "Should the power go out and stay out for over a year, 9 out of 10 Americans would likely perish." "A massive and well-coordinated cyber-attack on the electrical grid could devastate the economy and cause a large-scale loss of life." Just to remind you how easy it is to bring down the grid using nothing more than an Internet connection, look at what happened in the Ukraine! A cyber attack on their power grid caused massive blackouts for hundreds of thousands of people. The attack was so severe, it knocked out systems intended to help restore power. Computers were destroyed… even the call centers used to report outages were knocked out. Get this… U.S. investigators said that our systems aren't any more protected than those breached in Ukraine. "More than a dozen utilities said they constantly, sometimes on a DAILY BASIS, face attempted cyber-attacks. One utility said it was the target of about 10,000 cyber-attacks each month, according to the report." Homeland Security’s emergency response team confirmed that the U.S. power grid had been successfully hacked. And that the attackers used a technique called "brute forcing" and mechanical devices to get access to the grid for an "extended period of time. And it's not just a cyber attack we have to fear. A few years back, terrorist snipers FIRED on a California substation. They shot 100 rounds of ammo straight into transformer radiators. Thousands of gallons of oil leaked, causing critical equipment to overheat and shut down. It took months and $15 million dollars to repair damage done by the terrorists in just minutes. "...the most significant incident of domestic terrorism involving the grid that has ever occurred." And he's concerned an even LARGER ATTACK could be in our near future. "There is an imminent threat from ISIS to the national electric grid and not just to a single U.S. city." It means the terrorists are just getting started. So with these attacks happening already, the government is on top of things, right? Instead, they’re bickering over immigration! Laying out the red carpet for illegals and Muslim “refugees” and making the terrorists’ job that much easier. Putting the American public in grave danger. So much for protecting the citizens of this country. Good luck getting anything done with this do-nothing Congress, whose only concerns are how do I get re-elected, and who gives the biggest campaign contributions. Now, I know what I've already shared with you has probably got you pretty shaken up. I don't like being the messenger of doom. But it's important you realize what we're facing here. In just a few moments, I'm going to share with you the one item that will restore your hope for the future no matter what crisis is on the horizon. So stick with me, friend. And I promise, you’ll be glad you did. But real quick, let’s talk about the true state of the American power grid. Most people never think about it because until now, it's worked okay. You flip a switch and the light comes on. But is it really that simple? And why would it be so easy for terrorists to bring it down? Well the dying American power grid gets an alarming D+ from the American Society of Civil Engineers for infrastructure and the ability to handle demand. Talk about being ripe for a crisis! If you were to compare the grid to an American city, guess which one it would resemble the most? With all its ruin and decay, without hesitating, I’d say Detroit. Case in point, the best example we have of how weak the grid really is happened just a couple of years ago, when the East Coast got pulverized by Super storm Sandy. This "Nor' Easter" packed such a wallop, it knocked out power to over 250,000 NYC residents! I couldn't believe my eyes as I watched New Yorkers actually DUMPSTER DIVING for food after the storm, because they had no power and nothing to eat. It wouldn't take much to shove us all into the nightmare of an extended blackout. Record snowfall and frigid temperatures heaved record stress on the grid. It almost wiped out power for millions of people in America’s heartland! It was only the “heroic efforts of grid operators" that saved large parts of the country from total blackouts. Another icy subzero winter could spell disaster all across the nation. Philip Moeller, head of the Federal Energy Regulatory Commission, said that "...the experience of this past winter indicates that the power grid is now already at the limit." For those folks, all I can say is "Good luck, you're going to need it." But because you're here reading this, I know that's not you. You're not drinking the government Kool-Aid, and you know you've got to do whatever you can to protect your family. I've learned over the years that if something's gotta be done, I've got to do it myself. Just like you, I had to learn the lessons of self-reliance the hard way. But it's not just the government who's screwing things up. You probably know by now that power monopolies are as thick as thieves with the Feds. They get an endless amount of cash and fat tax breaks while the rest of us get tax hikes. And for you and me, it's just going to get worse. Chances are, I bet we share the same red, white, and blue values. That's why we need to keep fighting. And the only way to do that and make it count? By taking back our birthright—by becoming more independent and by hitting the government exactly where it hurts… the pocketbook. It's a pretty bleak picture right now. Soon, the burden on our already weak grid will become completely unsustainable. Not to mention that they're doing NOTHING to guard the grid against attacks that just keep coming. Now maybe you're thinking a backup generator would be just the ticket. But did you know that it takes a whopping 18 gallons of gasoline PER DAY to keep one running? Even a small generator with just enough juice to power a few lights costs over $30 a day to operate. That’s over $230 a week… more than $11,960 a year! As a hard-working American, you probably don't have piles of cash like that stuffed in your mattress. And gas prices aren’t exactly stable thanks to the increasingly volatile situation in the Middle East. Think that’s going to change soon? They’ll charge whatever they want! $5, $6, $10 a gallon - without blinking! So when you invest thousands of dollars in a gas generator, that's just the start. You stop paying… it stops working. Then there's the noise and pollution a gas generator makes. It's like advertising to any would-be looters, "Hey, I've got a generator, come and get it!" Don't kid yourself. When the bleep hits the fan, people will be trolling neighborhoods in no time. Scouring for resources... food, water, and of course, power. They'll take what they want, and they may even be armed! You certainly don't want to make yourself an easy target with a loud and stinky generator! Plus, who wants to breathe in those smelly fumes? They're deadly. You can't use gas generators inside your home. You're not even supposed to let them come close! Plus the risk of having to keep a huge supply of flammable gasoline near your house at all times! Have Been Pumped Dry as a Bone? Gas stations don't function without electricity anyway. What then? You'd be SOL, that's what. How about a natural gas generator? Well, sure! If you've got an extra $10,000 to $20,000 burning a hole in your pocket! Because that's what it’ll cost to buy one. Not to mention they’re obscenely expensive to have professionally installed. And you can't take it with you if you have to bug out, either! Nope… one strong storm will kill your power and your fancy generator in one fell swoop. Talk about a double whammy! Clearly, any kind of traditional generator is not a great option and is out of reach for most folks. So with a gasoline and natural gas generator out of the question, there has to be something else, right? How do you make sure your family has electricity, food, and warmth to keep them healthy, safe and comfortable? You need to know without a doubt that when the things implode and the rest of the world goes berserk, your family will be secure. And that means being as energy independent as possible. You don't want to worry about the ancient and insecure power grid dangling close to the edge of disaster. You don’t want to worry about a terror cell setting its sights on… substations that might as well be marked with a big bulls-eye. You don't want to have to resort to a gas-guzzling or natural gas generator, which are expensive and put the lives of you and your family at risk. You don't want to worry about another Hurricane Harvey or Irma wiping out power for days or weeks on end. Leaving you and your family completely helpless. You need to be sure you don't have to rely on any outside source to keep the lights on, appliances running, or your house warm or cool. The answer is having a way to harness the limitless and FREE energy from the sun, with a portable solar powered generator. Here’s the truth, folks: You need to make your home a self-powered oasis... with a reliable, discreet, and MOBILE source of power. No gas or propane required. Ever. Think about it... letting go of the worry of what will happen to your family during an outage... and never again being at the mercy of a crumbling, weak, and unreliable power grid! Hey... I didn’t want other Americans to be kept chained up in fear of what might happen to them when the power goes out... or be at the mercy of our corrupt government’s criminal negligence. So I took it upon myself to find a viable power-generating alternative that was reliable, discreet, and one you could take with you... anywhere! Knowing there HAD to be something better out there, I searched high and low for just the right kind of solar powered generator. One that could harness limitless FREE power from the sun... one that was powerful and could provide enough juice to keep vital devices running: lights, cell phones, laptops, tablets, appliances, even a freezer or a fridge. But most important? One that you could pack up in a matter of minutes, load into your car, truck, or RV, and get the heck out of dodge when a crisis hits. I got in touch with a rogue engineer based in Utah who is just as passionate about this as I am and 100 times more knowledgeable than me. This guy has spent years training as an engineer and has traveled all over the world for the past two decades, relentlessly researching the best way to generate and store the free power from the sun. And after hearing my story, he agreed to design a truly breakthrough power-independence solution. I can honestly tell you that you'll be stunned by how powerful and portable this generator is. It's got a state-of-the-art lithium-iron-phosphate battery (referred to as LiFePO4 by engineers) that charges using the included top-of-the-line folding solar panel. At only 38 pounds and with built in handles, just about anybody can lift it. It fits neatly in almost any cargo space, ready to go at any time. Compared to the alternatives, the Patriot Power Generator 1500 has so many advantages it's almost UNFAIR for it to be on the market. But before I tell you more, I keep coming back to this point. Being able to have a power source like this that you can recharge ENDLESSLY, that will never run out of gas and that you can keep safely and discreetly in your home OR grab it and go if you need to… THIS is true peace of mind for you and your family. Just imagine, this one device could be the difference between living through a crisis in safety and comfort or having to scramble desperately to meet your family's most basic needs. Power your fridge or freezer so you can have a long-lasting supply of food that's safe to eat. Not to mention your slow cooker, toaster oven, or even your coffee maker. Power lights in your home for safety and comfort. Power critical home medical devices. Portable oxygen machines, CPAP machines, mobility devices or monitoring equipment. Power cell phones, computers, TVs or radios so you can communicate with family and stay informed. Power an electric blanket to stay warm at night. You Know It Isn’t a Matter of IF You Need a Generator, But Which One? So let’s take a moment here so you can understand why my Patriot Power Generator 1500 checks all the “must have” boxes to be the finest personal power source available on the market. First off, we all know that gasoline generators, the most common type on the market, will make a TON of noise and pollute the air with noxious fumes. They'll also DRAW UNWANTED ATTENTION from looters when all hell is breaking loose and discretion is a must. The Patriot Power Generator 1500 is whisper quiet, fume-free, discreet AND SAFE. You can keep it right in your bedroom and still sleep like a baby. Natural gas generators may be able to power your whole house, but guess what? If a storm flattens your home, you're without your fancy generator AND the small fortune it cost to install! Not so with the Patriot Power Generator 1500. There’s no assembly or installation required. You’re not stuck in your house if a natural disaster heads your way – your Patriot Power Generator 1500 can “bug out” right along with you! And it’s truly "plug and play.” Even a child can easily use it. Just look how easy it is for Elaine C. to use her Patriot Power Generator. Even a kid could do it! Click the video to see Elaine use her solar generator! Step 1: Unfold and set up your solar panel in the sunlight. Step 2: Plug the solar panel into the Patriot Power Generator 1500. Step 3: Plug in your electronic devices and enjoy free, abundant power from the sun! The Patriot Power Generator 1500 offers up to 1,500 continuous watts of clean, quiet, and FREE renewable power. Even appliances like a fridge, small freezer or medical device that can sustain your family during a power outage caused by God knows what. Nice little power source when needed. I hooked it up to my camper and it ran everything but the air conditioner. Very simple and easy to use, thanks for offering a great little product!!!!!!!! That's right – renewable power with no additional costs ever! No gasoline, no propane - just the endless, FREE rays of the sun. Not only that, but the Patriot Power Generator 1500 can hold a full battery charge for up to a year with only a 20% leak… max! That's absolutely UNHEARD OF! It means that you can "set it and forget it.” If a crisis hits you won't have to wait for a charge, you’ll be good to go! But I'm saving the best for last. It weighs only 38 pounds and at only 18"L x 10"W x 12"H, it’s small enough to go anywhere with you. And its compact size stores discreetly by design, because no one needs to know you have a covert power source tucked away in your home. Don't be fooled by its small size, friends. This little generator packs a punch when it comes to delivering power. And don't think you have to wait until the "bleep" hits the fan to take advantage of this workhorse. Its small size, portability and ease of use make it perfect for camping, hunting and fishing trips. Take it along on your next RV vacation, or even weekend tailgating. I bet you can picture literally a HUNDRED ways you will use and enjoy having an easy, free source of power! Love it! Great purchase! A great piece of survival gear. Was looking for a small generator to run my CPAP machine at night because I quit breathing sometimes when I sleep and lose power a lot where we live. Got a lot more with the solar generator. Quiet and lightweight. We lost power for a day after a snow storm and we ran the cell phones, internet and satellite with the Patriot Power Generator 1500. Was able to keep cell repeater and internet going the length of the outage with a full charge and the solar panel connected. We have to be prepared. And I've thought of everything in this "little generator that could" so YOU don't have to. Advanced-Engineered Battery Technology: My Patriot Power Generator 1500 contains a safe, state-of-the-art lithium-iron-phosphate battery famous for its thermal and chemical stability. It’s virtually impossible for these batteries to overheat or catch fire. They’re far superior to older, out-of-date lead acid batteries, which can leak chemicals, cause a hazard to your family's health, and don't last nearly as long. No Assembly Required: Your generator arrives already assembled and charged. You don’t have to wait to try out your generator; you can start using it right away. Look how easy Mary P. got her generator going. The power went out several weeks ago so I got my generator, plugged in the fan, got a glass of iced tea, got my lantern and a book and I read the afternoon away. Love it!!! More Charging Cycles: You can fully drain and recharge the lithium-iron-phosphate battery inside your generator over 2,000 times. (Meanwhile, deep-cycle lead-acid batteries are only good for 50-100 cycles.) That’s the “magic” of advanced-engineering, folks! The “Triple Charge” Advantage: Charge your generator using the included solar panels, by plugging it into a wall outlet or by using a wind turbine. Fast and Flexible Charging: It sounds incredible, but my Patriot Power Generator 1500 is fully charged and ready to go in as few as 3.5 hours. That’s another reason we chose a lithium-iron-phosphate battery. It can be “fast charged” using the AC cord or included solar panels. And if you don’t manage to fully top off the battery to 100%, no worries! Unlike lead-acid batteries, that won’t damage your unit. Just charge up what you can and enjoy a reliable, steady flow of backup power. Hands down, lithium-iron-phosphate is the best choice. Longer Life Span – Holds a Charge for Up to 12 Months! The Patriot Power Generator 1500 requires virtually no maintenance. And it’s always ready to go, because it stays charged for up to 12 months, with a max leak of just 20%. That’s incredible! Up to 1,500 Continuous Watts of Power: Powers your cell phone, tablet, radio, lights, small appliances or critical medical devices. With proper power management, you could power your fridge or freezer INDEFINITELY. You'll never have to worry about your food reserves going bad. Can’t you just see how important having a generator of this power and quality could be? Your life could depend on it! Easy to use and it works! We put it to use keeping our freezer going when we had an extra long power outage. It worked as advertised. Although we have not charged the unit we did have the solar panels out and reviewed how to set it up. We are very happy to have this unit in the house and ready for action if and when needed. Commercial Grade, 100-Watt Folding Solar Panel: This solar panel has a rugged, durable metal frame with reinforced corners. You don't need to worry about handling it with kid gloves! It folds easily for discreet storage and includes a sturdy carrying handle so that you can take it anywhere. "Daisy Chain" Additional Solar Panels for Even More Power: You can connect more solar panels to your generator. This will DOUBLE or TRIPLE your power so you can use more devices. And it can cut your charging time in half. Doesn’t that sound good to you? Well sure it does! You and I both know there are some things you simply can’t put a price tag on... your family’s safety and survival being the most important. As you can see, for solutions that even come close to my Patriot Power Generator 1500, you could expect to pay $10,000 or more. But even though I could charge close to that, I simply in good conscience couldn't do that to my fellow hard-working Americans. I knew I had to offer the Patriot Power Generator 1500 at a price that wouldn't be completely out of reach for most folks. So I'm offering it at an introductory price that just covers manufacturing costs and helps defray some of the research and development expenses. Fact is the retail price of the Patriot Power Generator 1500 is $3997. But because I feel that strongly about making sure you and your family are secure… I’m going to do you one better, and offer the Patriot Power Generator 1500 for an unheard of limited-time price of $1997. That’s $2000 off the regular price… a 50% discount! And to put my money where my mouth is… I’m willing to offer a low monthly payment plan for those who need help with the purchase price. We’ll even ship the whole package out to you right away. Now, my friends think I'm crazy to offer an advanced-engineered, powerful and portable generator at a discount like this. And I can’t keep the price this low forever. But folks, I want you to experience the peace of mind that you get from the Patriot Power Generator 1500. It creates free electricity for you immediately and protects your family in case of a crisis. Isn't it worth it to know you’ve got the ONE thing - the GLUE - to keep your family's life together, no matter where you are? You could be at home, or in your RV, cabin, or undisclosed, completely off-the-grid location. It DOESN'T MATTER. If the sun is shining, you can charge your Patriot Power Generator 1500 for FREE. And it will power your critical devices 24 hours a day, 7 days a week, 365 days a year. Not one, not three, but TEN incredible FREE bonuses if you act now. This is an incredibly valuable item, and I want to get it into your hands with the least amount of hassle and worry for you. Let me tell you, with state of the art technology like this, the Big Government regulators really make you jump through some serious hoops, but I’ve “dotted all the i’s” and “crossed all the t’s” and fought through the red tape so you don’t have to mess with it! Your Patriot Power Generator 1500 will be delivered right to your door in plain packaging that won’t reveal the contents... it’s totally covert. And it’s all on my dime! And remember, it arrives fully assembled and charged, so it’s ready to go as soon as you take it out of the box. Having this heavy-duty extension cord for your solar panels means that your panels can be outside soaking up the sun while your actual generator is inside giving you much needed power! In this report, learn exactly why our power grid is teetering on total collapse, and how to avoid the aftermath when it finally does! This is the information the government and the power companies DON’T want you to see! Find out exactly what you can expect when a blackout hits, plus what you need to do beforehand to make sure you’re prepared. Get the tips and tricks you need to keep your family safe and comfortable during the blackout, and what you can do after it’s over to get life back to normal. Now that you’ve got your generator, make sure you have everything else you need to survive a crisis. You’ll be surprised by the some of the common household items that can make a huge difference in a disaster situation! The government claims that so-called “smart meters” are going to help reduce energy use and lower costs. This report reveals what they’re NOT telling you. The next three free bonuses are really my “survival essentials,” and I want to make sure you have them too. You’ll get a 72-hour emergency food kit packed in airtight packaging that’s rated for 25 years of storage. That is 16 full servings of survival food, 3 days of complete meals. These meals are delicious, nutritious, easy to prepare, and can literally save your life in a crisis. This advanced water filter removes up to 99% of waterborne bacteria and parasites and provides you with crystal-clear, life-giving water when no clean drinking water is available. It can be carried anywhere since it weighs only two ounces. It contains no chemicals and no moving parts, and requires no electricity or batteries. This compact but powerful survival tool packs 11 functions into a tool no bigger than a credit card and fits right in your wallet, so you'll always have it handy. Even in the middle of a crisis, everyone needs something to relieve the tension and bring everyone together, and there’s nothing like a deck of cards to provide hours of family entertainment. Plus, every playing card in this deck has a free tip about generating or conserving power. Let me spell it out for you (you'll be floored by this!). This is a 365-day, 100% money-back guarantee. I want you to try your generator in your home for a full year. Really put it to the test. Charge it up and drain it many times. I want you to get to know your generator and what it can do for you. If it doesn't do everything I say or if you're unsatisfied for any reason, return it and I'll give you your money back, no questions asked. You literally can't lose. And if you act now, I’ll also throw in something I’ve never offered before, to prove that I have total confidence in this product. For the life of your Patriot Power Generator 1500, you’ll get FREE reliable and knowledgeable technical support. Our customer service team is made up of real people – Americans. Not some 800 number routed over to a basement call center in India or the Philippines, forced to talk with someone named “Bob” with an accent you can barely understand. Most companies would choke on such a guarantee, but for me it’s just part of doing business. Up front, honest and ethical. The American way. And please don't think you can get this generator anywhere else. You can't. The Patriot Power Generator 1500 is NOT available from any store, website, or distributor. You can only get it here. AND QUICKLY. It takes over a month to manufacture these state-of-the-art generators. And there's a LONG wait for more units once we sell out. No pressure, but I need to give you fair warning on the supply situation. That's why you need to act fast. When you order you’ll get an order confirmation right away. We’ll rush your generator to you from our warehouse in Utah and you’ll get a tracking number as soon as it ships. Just so you know what to expect, a few weeks after you get your generator, we’ll politely ask you to review your purchase. It’s totally optional, we just appreciate the feedback. And to date we’ve gotten 227 verified 4- and 5-star reviews back from customers. These are not anonymous, paid, fake reviews, folks. Only real Patriot Power Generator 1500 owners can review the generator they purchased. It's 8:47 AM and the "you know what" has just hit the fan. People are panicking in the streets—it's all over the radio and TV. A news anchor comes on screen and says in a shaky voice, "We have reports of widespread power failures sweeping the area. If you’re watching this, your power could go out at any moment. We are now in a state of emergency. I repeat, we are now in a state of..."
The TV blinks out. Your lights go dark. An eerie silence fills your home. You turn on your portable AM radio and hear rumors of looting and unrest. This time, it’s closer to home. Your family looks to you. "What's going to happen?" they ask. The look of fear in your family's eyes hits you like a punch to the gut. What are you going to tell you them? What have you done to prepare? It’s entirely up to you, which way you go. And if you don't take action to get your generator right now, you'll be in the same boat as the brainwashed masses that think, "Everything is fine.” And if a crisis hits and your family asks, "When will the power come back on?" your mouth will go dry and you'll feel powerless. But what if you decide right now to secure your generator instead? Just imagine how much better you'll feel right away. You'll calmly reassure your family that they're safe and they'll have plenty of electricity to power critical items. You can power the fridge, freezer, cell phones or medical devices. Your home will be a little island of light and warmth, even when it’s dark everywhere else. Your generator will be a source of comfort and strength in the storm. Your family will think you're a hero, because you will BE a hero. Can't you just imagine how good that will feel? I don't know exactly when or how the next power grid disaster will hit. But from everything I see, it could be soon and it could be a big one. That's why I want you to get your generator now. Click the "Add To Cart" button below. You'll be glad you did. Remember, this generator makes free electricity from the sun. So even if I'm wrong and everything turns out fine, then you'll still come out ahead and be able to generate free electricity for you and your family. If you want to get real power independence and security, click on the button at the bottom of this page. You'll be glad you did. This is about peace of mind, knowing that you and your family are well protected in the case of a blackout. Sounds good, right? Click on the button below and get your Patriot Power Generator 1500 rushed to you before they're all gone. And then rest assured knowing that you will be able to keep the lights on no matter what happens. 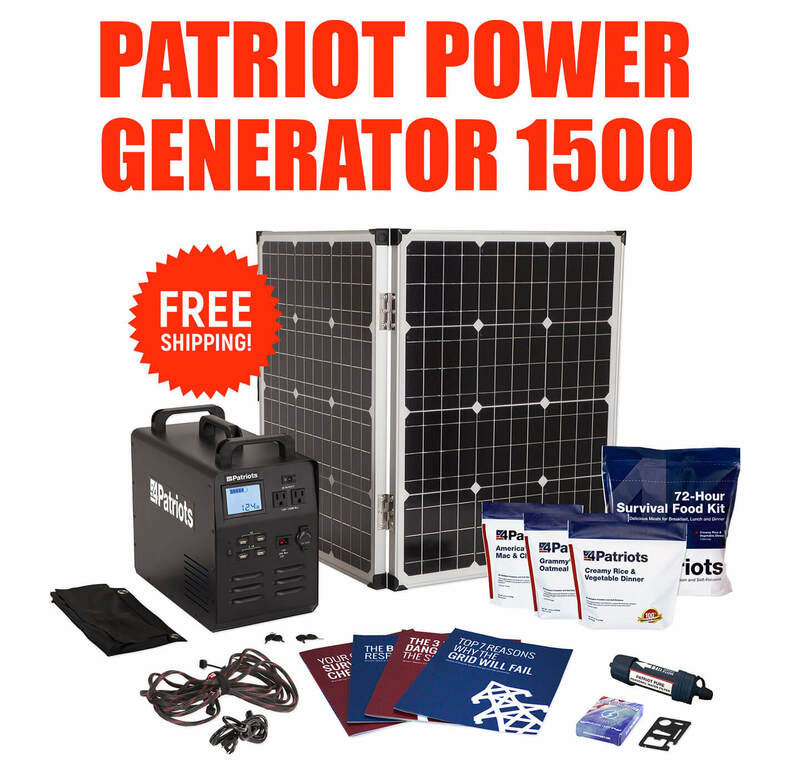 To get your Patriot Power Generator 1500 rushed to you at this special price, plus the 10 FREE bonuses, click the big “Add to Cart” button below. Folks, all the warning signs of a power grid disaster are blinking like the legendary neon lights of the Las Vegas strip. It couldn't be more obvious. It's not a question of if... it's a question of when. Click the "Add To Cart" button below NOW to get your Patriot Power Generator 1500 rushed to you right away. 1. Fox News. McKay. "Millions of American lives could be at stake as North Korea threatens to attack power grid." 2017. 2. Wall Street Journal. Smith, R. "How America Could Go Dark." 2016. 3. USNews. Braun. "Who is Guarding the Grid?" 2016. 4. Bloomberg. Natter & Chediak. "U.S. Grid in Imminent Danger From Cyber-Attack." 2017. 5. Fox Business. Giampia. "US power grid is vulnerable to attack: Fmr. NRG CEO." 2017. 6. Wall Street Journal. Smith, R. "Cyberattacks Raise Alarm for U.S. Power Grid." 2016. 7. The Wall Street Journal. Landers. "Electromagnetic Pulse: North Korea's Latest Threat Against U.S." 2017. 8. Forbes. Morgan, S. "Major Cyber Attack On U.S. Power Grid Likely." 2016. 9. Foreign Policy. Cyber Squirrel. "Threat to America's Electric Grid is Much Bigger Than You Can Possibly Imagine." 2016. 10. E&E News. Behr, P & Sobczak, B. "Grid Hack Exposes Troubling Security Gaps for Local Utilities." 2016. 11. The Economist. "America's utilities prepare for a nuclear threat to the grid." 2017. 12. Bloomberg Technology. Malik. "Can America's Power Grid Survive an Electromagnetic Attack?" 2017. 13. New York Times. Sanger & Broad. "Pentagon Suggests Countering Devastating Cyber Attacks With Nuclear Arms." 2018. 14. Forbes. Douris. "As Cyber Threats To The Electric Grid Rise, Utilities And Regulators Seek Solutions." 2018.